In response to my cousin Benny’s questions…my last post could use a little more background information. Here is how enforcement of the MPA works. Most people guarding the sanctuary are normal community members; I would say that usually they do not carry weapons unless they are authorized to do so as a deputized Fish Warden and issued one. If you are guarding and catch a violator, you have options. As I saw a few times, the women pulled out whistles and yelled at violators who were walking the tide flat and searching for creatures to eat. These are considered warnings and are often undocumented. 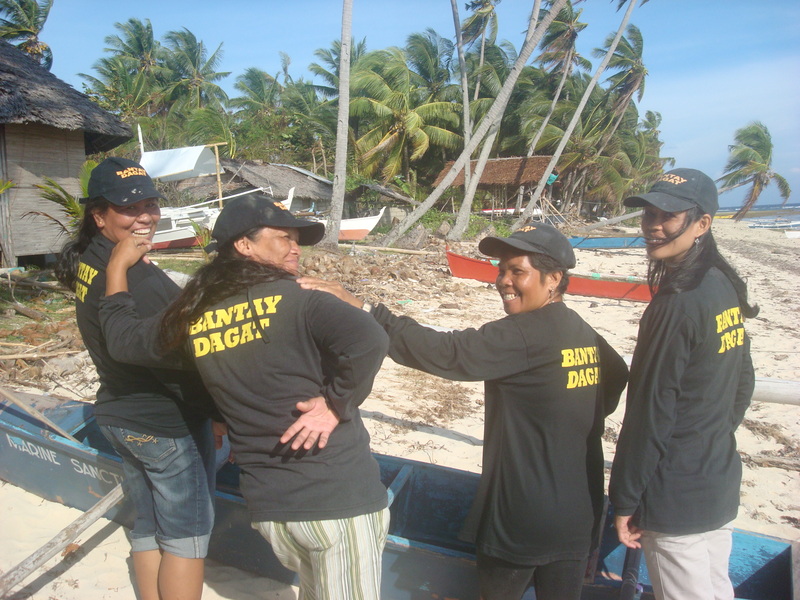 If you catch someone fishing in the MPA and you are not a deputized Fish Warden (Bantay dagat) then you can not arrest them. You have to contact the police; they have to come directly to the site or get some bantay dagat together in a boat and cruise to the site. The bantay dagat do not receive many benefits; one of the things that diver’s users fees can go towards is ensuring that a bantay dagat’s family will receive money if he/she dies while on duty. 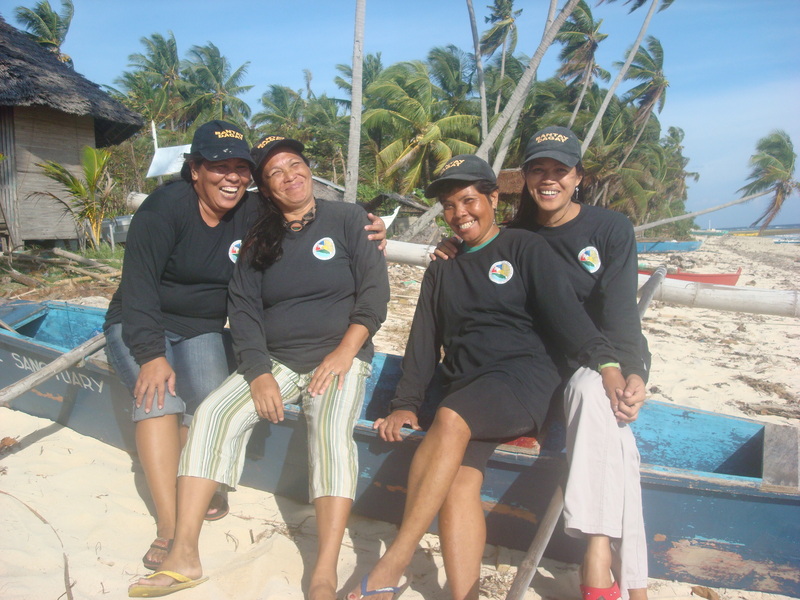 These are their outfits; only Belyn on the left is a deputized fish warden, the other women are wearing their husband’s gear. She and her husband were on patrol one night, probably shining the flashing around the area like usual, when they caught an illegal fisherman. When they approached him, he dropped his net and ran. She ran the half mile or so to the police station, but by the time they came back, the man had returned to take his net and disappeared. Even though she can identify the violator, she can not do anything about it other than write it down in the police logbook. One of the big challenges is the intrusion of commercial fishing boats within what is legally declared the property of the local government (15 km from the coast). The boats can come from anywhere in the Philippines, or even Malaysia or China, and what is the local government to do? They are no match against the guns and political power of commercial fishing fleets.